If your car or truck hesitates when the transmission shifts gears, it’s time to check your transmission fluid — actually, it’s past time and hopefully no serious damage has been done. Transmission fluid is like the lifeblood of your transmission. It keeps it cool, lubricated, and functioning properly. For more information on the importance of transmission fluid, check out this recent blog post. Not a words person? That’s okay. 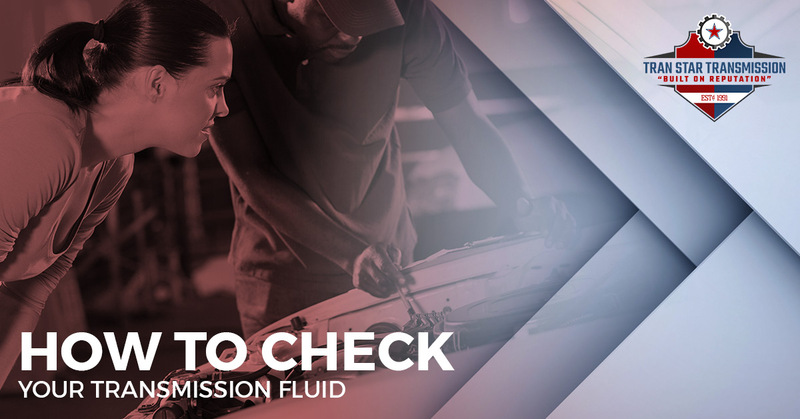 Check out these helpful YouTube videos on how to check your transmission fluid level. Park the car, set the parking brake, and start the engine and let it reach normal operating temperature (Be sure to check your owner’s manual. Some automatic transmission fluid levels are checked with the engine off). Pull out the dipstick. Do this slowly since the fluid may be hot. Clean the dipstick using your rag. Reinsert the dipstick fully and then remove it again. Observe the marking on your dipstick. There will likely be two markings. One that represents full when warm and when cold. If the ATF level does not come up to the warm line, you’ll need to add automatic transmission fluid. Check the condition of the fluid. Your fluid should be clear and not have a burnt odor. Learn more about how your transmission fluid should look here. Add transmission fluid to reach the line. Do not overfill! And make sure that you are using the right type of transmission fluid. Reinsert the dipstick fully and relax. The ATF dipstick looks a lot like the oil dipstick. It is often yellow or orange. If your vehicle is front-wheel drive, the dipstick will be sticking out of the transaxle, which will be toward the front of the car likely near the oil dipstick. For rear-wheel drive vehicles, this dipstick is located more toward the rear of the engine, behind the oil dipstick. If you are not sure about the location, consult with your owner’s manual or stop by your local transmission shop. There are many different types of transmission fluid. Each type is made specifically for a specific type of transmission. For example, many newer vehicles will require different fluid than older vehicles. Before ever adding transmission fluid into your transmission, be sure that you are 100 percent certain that it’s the right stuff. Did you know that your vehicle should not lose automatic transmission fluid? Unlike motor oil, your transmission doesn’t naturally burn fluid. If the level is low, this likely means that there’s a leak somewhere. Also, the symptoms of a faulty transmission are very similar to a transmission that is low on fluid. Because of this, it’s important to keep your fluid levels sufficient and also get any problems inspected by a transmission specialist. If you are in the Houston area and are in need of transmission repairs or maintenance, stop by our transmission shop. From a simple transmission fluid change to a full rebuild, we’ve got you covered. We even offer free diagnostic checks! Give us a call to learn more — (713) 574-1473.